The youngest of children soon learn to enjoy the music of words in the rhythm and rhyme of traditional nursery rhymes. From this, we can develop a real delight in the joy of action rhymes by offering children a means of expressing themselves in a structured but stimulating way in response to rhyming language. This poem seeks to spread that happiness by linking its words and actions to other children in the world, inviting them to share the same excitement in physically responding to words. Use this fantastic action rhyme to get your children up and moving. 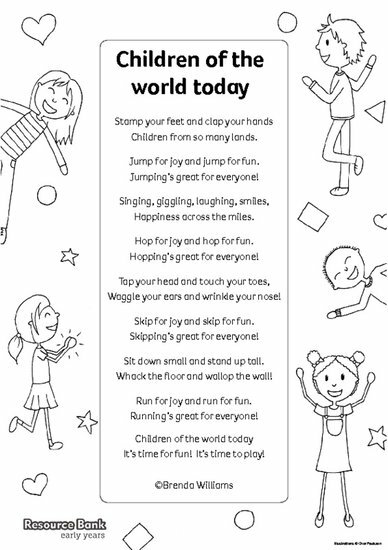 The poem can also be used as a colouring sheet to keep children entertained while thinking about other children from around the world. Early Years members of the Scholastic Resource Bank can get instant access to this poem and thousands more online resources. Our finely crafted resources include lesson plans, teaching ideas, planning and assessment tools, activity sheets, interactives and video.